With custom rotomoulding, parts can be moulded economically in a variety of shapes and sizes, many of them difficult to produce by any other process. Industrial and commercial products in the agriculture, health and science or point of sales areas include specialty tanks and containers for fuel, water, and chemical processing, livestock feeders, drainage systems, food service containers, instrument housings, fittings, medical equipment, safety helmets, vending machines, highway barriers and road markers. Consumer products in the recreational, special application, toy and transportation areas include boats, kayaks, child care seats, light globes, tool carts, tables, planter pots, youth beds, play balls, playground equipment, headrests, truck/cart liners and air ducts. To learn more about some of the range of products that rotational moulding can offer, you can download this World of Application brochure that has been produced by the North American Association of Rotational Molders. The rotomoulding process requires three components: a mould, a moulding machine & plastic powder. Bushmans uses a variety of machines for different sizes of products that are required to be made. same step by step process. Our Ferry machine is a “carousel” design. In this machine, the moulds are mounted on an arm that imparts the biaxial rotation to the moulds and carries them sequentially into the heating zone, the cooling zones, and finally into the de-moulding/charging area. Four arms are used so that heating, cooling, and servicing can be carried out simultaneously on four different sets of moulds. Our Ferry features the latest design innovations to allow the arms to be moved independently of each other. space for the moulds in the cooling station (3) to move out to the unloading station. Finally, the moulds in the holding station (2) can move into the cooling bay. As Bushmans are rotational moulders, we can help our customers with the entire process, starting with the design of a part. We discuss needs and requirements with you and create a part that will fit all of your specifications. Designing for rotational moulding is a specialist area and requires a thorough knowledge of the process and its effect on the final part. To learn more about the custom moulding solutions we can offer you, learn about what we do and how we do it. 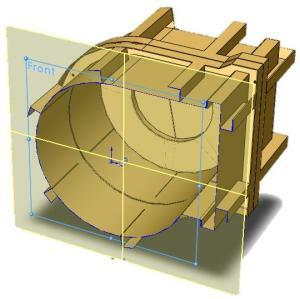 If your product is already designed, Bushmans provides a service whereby we review your product design and provide recommendations to improve mouldability, reduce part and mould cost and reduce any long-term maintenance issues.